Boy have we been busy! Since May 2010, we have launched over 15 new websites! All of these, along with our previous work, can be seen by visiting Our Work!!! From all of us at JB Systems, we hope you enjoy browsing our work! JB Systems is proud to announce our newest website (and masterpiece!) for Chippewa Valley Bean, the United State’s largest kidney bean operation. 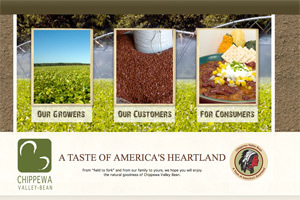 Located in Menomonie, WI, the Doane family has been operating the farm since since 1858. After researching several firms, they chose JB Systems for our keen sense of website knowledge – and more thorough suggestions for their site than what other developers offered. The website, seated comfortably at www.cvbean.com, is a great example of how we at JB Systems can combine some of the latest website technologies with dramatic imagery – thus creating a site that is not only functional, but (dare we say) gorgeous. The images, a combination of ones accumulated previously by Chippewa Valley Bean, and ones shot by JB Systems ourselves, helps bring a more intimate and “real life” view of what goes on at the farm. This, along with some easy-to-use administration tools that allows C.V. Bean to keep parts of their website updated – provides a “recipe” for one awesome website. We want your feedback! Take a look at the site and COMMENT BELOW. 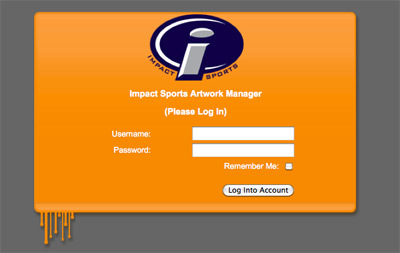 Impact Sports, a division of Genesco (the parent company of Hat World, Lids.com, Journeys, and Dockers Footwear), chose JB Systems to implement their proprietary Artwork Management System. After upgrading their company’s internal business management and invoicing software, Impact still had a need for their art department to manage their artwork files. Sounds like a pretty straightforward task, except the anticipated number of files to store was going to range between 60,000 and 100,000 pieces – all needing to be tagged, categorized, and more. To make matters even more interesting, the “Art Manager” (as it’s been code-named), needed to integrate with the databases (MSSQL) of their new management software. JB Systems (or the Labs) implemented a proprietary solution that accomplished all tasks – and housed in a secure server environment. The new application has streamlined their artwork approval process with clients, enhanced the quality control of their artwork, provided back-end integration with their management software, and more. We’re proud of the system we’ve created and excited to work with Nike’s largest North American distributor. This is a testament to the quality of programming and project management that the JB Labs (at JB Systems) can provide – from small companies to multi-million dollar ones. More next time – and thanks for reading! 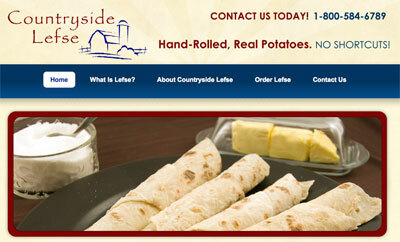 JB Systems’ newest e-commerce site COUNTRYSIDE LEFSE has had a tremendous first season, accumulating gross sales in access of 3 times its cost within 60 days. Being a relatively straightforward e-commerce site, the developers at JB Systems provided a cost-effective solution catering to one goal: Create the most easy-to-use Lefse-ordering website online. Period. Using technologies such as security certificates from Comodo, our newest billing and shipping technologies, as well as UPS integration for quick & easy label printing – JB Systems went to work. After 60 days of being live, and having paid for itself in that time period – we’re proud to say mission accomplished. at random on different pages. Features include statistics, link tracking, weighted advertisers, and more. This is another success for JB Systems and we look forward to working closely with the Home Builders Association in the future! In our quest of unveiling new technologies, this time around using jQuery- we’d like to steer to you RainMaster Lawn Systems. The use of a new jQuery library allowed us to add some PIZAZZ to their customer testimonials page. Notice how the testimonials take precedence over everything once you click the “View Testimonials” button. Convenient “left” and “right” arrows allow you to “step through” the different images (way cool hand-written testimonials).